Right, let me first set one thing straight: yes, I’ve just returned from a trip to China, and yes, I haven’t posted any Chinese food-related post yet. But it will come. Don’t worry. I just haven’t had the time to sort through my China pics yet, nor to make any Chinese food. This quiche was made and photographed before my China escapade, so please be patient dear friends, it will come. 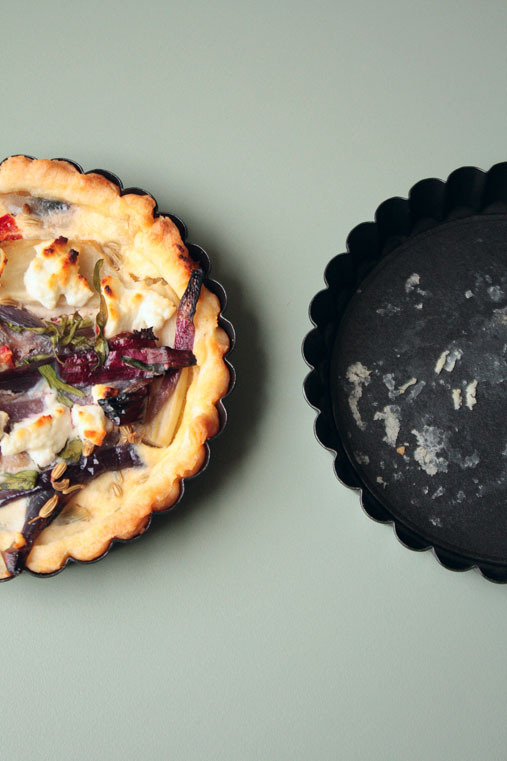 Anyway, over to this week’s recipe – a good old European quiche! So, is there anything nicer than a good old Quiche? So simple to make, so versatile in its toppings, and it can be eaten hot or cold? The perfect treat for the current picnic season! I like classic quiches, like quiche Lorraine (with cheese and bacon), courgette quiche or mediterranean quiches, but I also love playing with more unusual combinations. For this quiche, I thought I’d come up with an interesting vegetarian option. I normally don’t cook with fennel, but have been willing to do so for ages. When you cook fennel, it actually loses its sharp liquorice flavour and becomes very subtle – that’s why I’ve added fennel seeds to the quiche to complement the fennel and give it a little boost. Chili adds a kick, then there’s the melting red onion and creamy goats cheese – all rounded off by some spicy tarragon. Lovely! What I particularly like about quiches is that they are a very quick standby meal – that is if you use ready-made pastry. It’s obviously not as amazing as home-made pastry, but I think that a good quality ready-made shortcrust pastry really can do the job. For these quiches I didn’t have the time to make my own pastry, but if you feel like making everything yourself, you can make these little tarts with my polenta pastry. Peel the onions, cut them in half, then cut them in thin slices. Heat the olive oil in a frying pan and fry the onions for 3 minutes. Meanwhile, cut the fennel into chunks (discarding the green leafy bits). Add the fennel to the red onions and fry for another 5 minutes (you can add a dash of white wine to the vegetables at this stage, and make sure it is fully absorbed before you turn off the heat). Season with salt and pepper. Remove the seeds from the red chilis and chop. Add to the onion and fennel mixture. Sprinkle the mixture with fennel seeds and set aside. Grease your tart tin(s), roll out the shortcrust pastry and fit it into the tin. 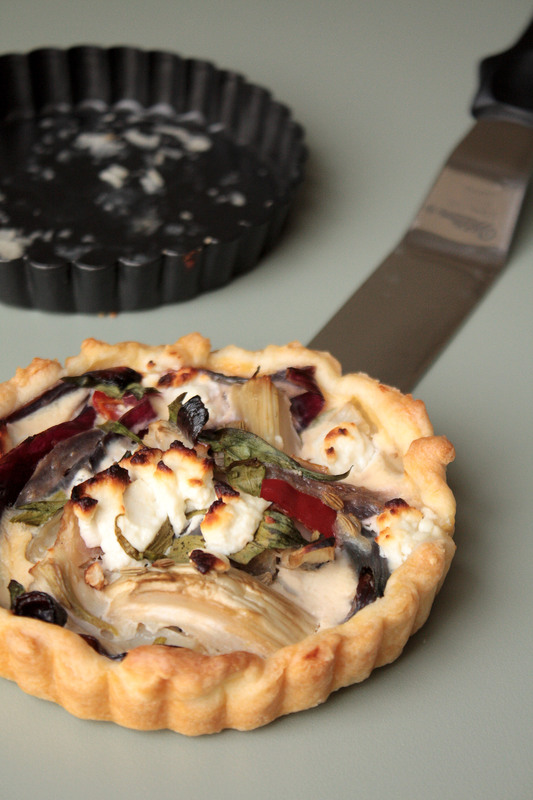 Spread the red onion and fennel mixture evenly into the tart tin. Make the custard: in a bowl mix the eggs with the cream, white wine and tarragon (if you use it). 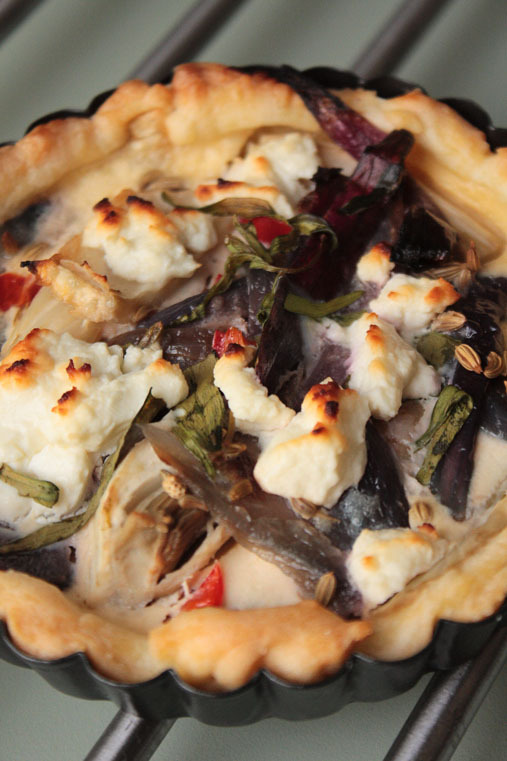 Season generously with salt and pepper and pour over the vegetables in the tart tin. Crumble the goats cheese over the quiche. Bake the quiche for about 50 minutes (if you bake small quiches, make it about 40 minutes), and sprinkle with fresh tarragon before serving.